Recreation and public lands means big business for the town of Moab. That’s why Interior Secretary Jewell’s hard work supporting the collaborative approach of the Moab Master Leasing Plan—which promotes both “smart from the start” oil and gas development—is so important to Moab’s business leaders. That’s why Public Land Solutions is so proud to sponsor a five-day advertising campaign at the Outdoor Retailer show, featuring some of Moab’s most innovative business leaders as they join us in expressing our thanks to Secretary Jewell for being willing to do the heavy lifting to protect Moab’s outdoor-recreation economy. Working with a diverse array of stakeholders, we’re on our way to developing a balanced approach that puts Moab’s outdoor-recreation economy on an equal footing with energy development. Gareth Martins, director of marketing, Osprey Packs Inc. Businesses thrive in Moab because public lands present world-class recreation opportunities in such places as Castle Valley, Gemini Bridges and Indian Creek. Two of the nation’s most iconic parks—Arches and Canyonlands—bring thousands of visitors to Utah each year. The revenue they create powers local governments and thousands of good jobs. Those businesses deserve to be heard—and so do the thousands of Americans who enjoy our most iconic wild places. Together, we can work hard to create a scenario where both energy development businesses and outdoor recreation businesses can succeed, while we preserve our most treasured wilderness as spaces for Americans and our children to experience the outdoors for generations to come. There’s no question that the U.S. Bureau of Land Management have a tough job. They aren’t as celebrated as rangers in our national parks and national forests, but their job is just as important to balance multiple use and natural resources on public lands such as outdoor recreation, wildlife habitat, watersheds, air quality, energy development, and mining. All too often, things get divisive as “us versus them” in the public lands debate with BLM land mangers stuck in the middle. Utah BLM has shown it doesn’t have to be that way for Moab. 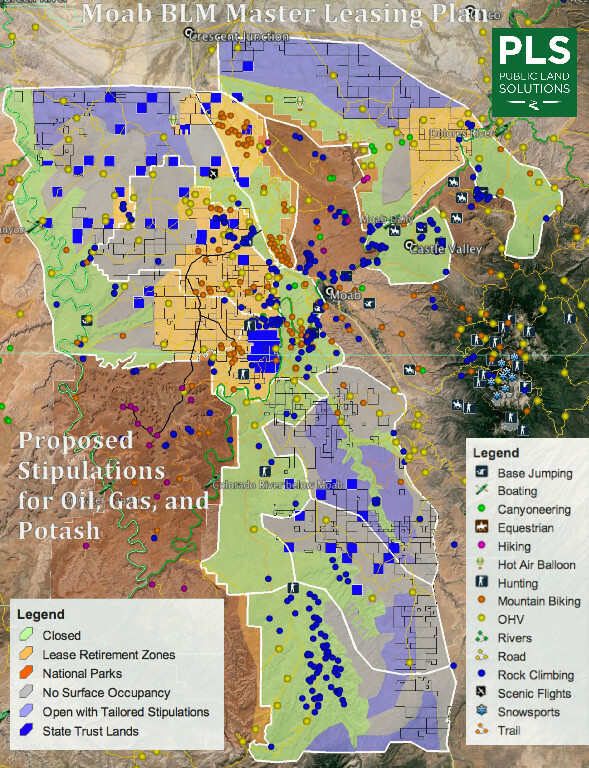 Last month, after a lot of hard work and outreach with stakeholders, they developed a smart-from-the-start approach for balancing oil and gas development with outdoor recreation and tourism for public lands in the Moab area. Outdoor recreation brings in hundreds of millions of dollars in economic development to the Moab thanks to our stunning national parks and the world-class recreation opportunities on adjacent BLM-managed public lands. From visiting Arches and Canyonlands, to biking Slickrock Trail, or rafting the Green River, opportunities abound to enjoy the Moab area’s great outdoors. By attracting hundreds of thousands of visitors, public lands pump money into the local economy, sustain businesses, and create jobs. Not only are outdoor recreation and tourism fundamental drivers in our local economy, they are critical to our local tax bases providing 2.5 to 3.5 times more revenue than energy development and mining for Grand County. However, we don’t have to have a zero-sum game of one industry versus another. Utah BLM has proven that we can have both a robust economy built upon the protection of public lands and the responsible development of oil and gas development and potash mining. Specifically, Alternative C in the Moab Master Leasing Plan presents the best opportunity to protect the lands critical to outdoor recreation and thousands of local jobs while still allowing responsible drilling and mining projects to move forward. In fact, 56 Utah businesses (more than 45 of which were based in Moab) submitted a proposal backing a similar approach. Striking that balance is no small feat, but that’s what Utah BLM accomplished with Alternative C. For that great work and progress on the Moab Master Leasing Plan, Utah BLM deserves high praise and thanks from the Moab business community. There’s still a long way to go before the Moab Master Leasing Plan is finished, but Utah BLM is on the right track. 50+ Utah businesses submit Moab Master Leasing Plan recommendations and map to the Bureau of Land Management urging specific location-based recommendations to enhance and maintain Moab’s world-class recreation economy. A new PLS white paper outlines proven strategies and policies for allowing recreation and energy development to exist in harmony. Urges the BLM to implement the strongest plan possible to protect tourism and recreation values on our public lands and rivers while facilitating the responsible development of oil and gas drilling and potash mining. This plan is a win-win for all stakeholders and marks an important milestone for the recreation industry. The Bureau of Land Management (BLM) announced today the Final Moab Master Leasing Plan that will bring balanced zoning for oil, gas and potash development in and around the Moab area, including the federal lands between Arches and Canyonlands national parks. The Bureau of Land Management issued a notice of intent on Tuesday May 17,2016 to prepare a Master Leasing Plan (MLP) for over 500,000 acres of the San Rafael desert in Southern Utah. The plan aims to consider oil and gas leasing and post-leasing development, as well as areas to be protected.